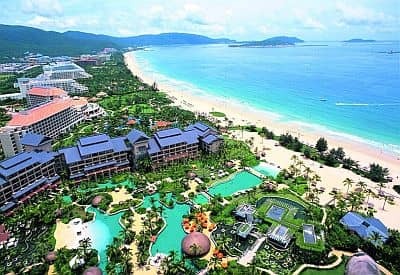 On the island of Hainan, the southernmost province of China, the climate is almost tropical, with very mild winters and long, hot, muggy, and rainy summers. In fact, the average January temperature is slightly lower than 20 °C (68 °F) in the north, and slightly higher in the south. Rainfall is abundant from May to November on the eastern side, while the western side is more sheltered, and receives moderate rains only from June to October, and abundant in August and September. Therefore, on the western side, the total annual rainfall barely reaches 1,000 mm (40 in), not much for a tropical area, while on the eastern side of the island, it rains about twice as much. On the northern coast, where the capital, Haikou, is located, the average January temperature is 18 °C (64 °F). In winter, the north-east monsoon brings cloudy days during which there are some drizzles, or fog can form. Sometimes, cold and windy days can occur, with highs around 15 °C (59 °F) or even below. In January 1977, the temperature dropped to 3 °C (37.5 °F), while in January 2016, it dropped to 6 °C (43 °F). Here are the average temperatures. In Haikou, rainfall amounts to 1,600 millimeters (63 inches) per year and is abundant from May to October. In Haikou, the sun shines about 2,000 hours per year: in winter, the sky is often cloudy, while from May to September, the sun shines a little more often than in the southern part of the Chinese mainland. The sea temperature on the north coast of Hainan is similar to that of Guangdong, although it is a bit warmer in winter. However, it is a bit cool for swimming from January to March, while it is pleasantly warm from May to October. On the southern coast, where the tourist resorts are found, the winter temperature becomes milder, and the climate can be defined as tropical, in fact, the January average is 22 °C (72 °F). However, from November to March, the night temperature can sometimes drop to around 10 °C (50 °F). Here are the average temperatures of Sanya, the largest city of the southern coast. In Sanya, rainfall amounts to 1,400 mm (55 in) a year; the trend is very similar to that of the north coast, but the period November-April is drier because this coast is sheltered from the north winds. In winter, the sun shines more often on the southern coast than on the northern one. On the southern coast, the sea is also warmer in winter, in fact, the water temperature does not drop below 23 °C (73 °F) in January and February: after all, you can swim even in winter. On this island, the interior is occupied by hills and mountains, where lush forests grow. The highest mountain is Wuzhishan (the "five finger mountain"), 1,840 meters (6,040 feet) high. On the top, the daytime temperature is around 10 °C (50 °F) from December to February, and around 20 °C (68 °F) from May to September. However, access has recently been closed to foreign tourists. 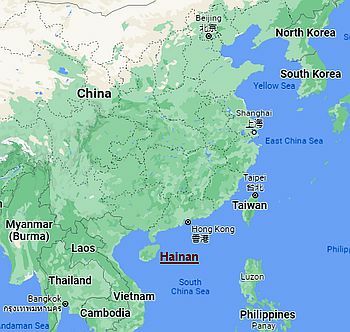 Together with Southern China, Hainan can be hit by typhoons, the tropical cyclones of Southeast Asia. Typically, typhoons occur in this area from June to mid-November, but sometimes (though very rarely) they have affected this area outside of this period, i.e. in April or in May. If you want to go on excursions on the island of Hainan, you can choose the coolest period, from mid-November to late March. For a beach holiday, you can choose the month of April (or even May, which, however, is warmer and rainier). The May-September period is hot and muggy, with showers and thunderstorms that can even be strong, but also with some hours of sunshine. From June to mid-November, typhoons can occur, which bring strong winds and torrential rains. On the southern coast (see Sanya), there can be days that are warm enough for sunbathing and swimming even in winter. On cool and cloudy days, you can go on excursions on the island.